We’re a small team at South Downs Secure car storage. The facility is managed by myself, Martyn Sands, but I feel fortunate to be able to call on the expertise of our trusted affiliates and consultants. As the weather starts to warm it’s time to think about touring. 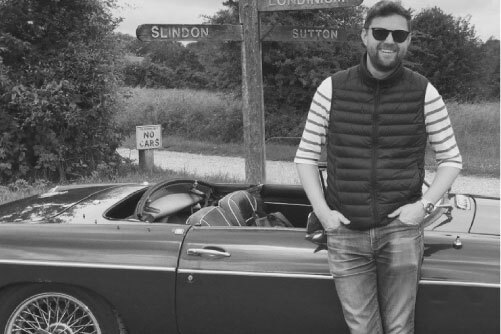 With that in mind, I thought it would be appropriate to introduce you to our Automotive Travel Consultant, Thomas Brimblecombe, (also known as @theautomobilist on Insta), and Product Manager at Travel Destinations. From an early age, I wanted to get behind the wheel of anything that moved, be it the ride on lawn mower or pedal powered go-kart. The first proper car though was an old Talbot 90 convertible, with column gear change, saying that I think I may have learnt about clutch control in a Renault Espace, the original boxy one. A 998 cc mini, it was brown when I got it although by the time I passed my test it was BRG with a white roof on white weller wheels. It looked fantastic. Mechanically it was a little ropey, but I loved it. I am lucky enough to have a few fun cars. First up an MG C convertible (again BRG) my Dad bought this car when he was in his 20’s. It will be passed on to my son after me. I also have a Humber Super Snipe estate car, series 5 60’s car. Great fun, perfect for transporting the family to the Goodwood Members Meeting. I also have a 1996 XJ6 LWB, which until recently was my daily driver. Lastly, I have a share in an E36 M3 track day car; I call it the stress buster. I’d be quite happy with Porsche GT3 Touring, perfect car probably just as long as I can keep my classics. If you were on James Corden’s Carpool Karaoke what track would you sing along to? *checks Spotify account… Apparently, Dreaming of You by the Coral! What is your favourite driving route in the U.K. and why? Llanadog to Brynamman on the A4069. It’s famous as a popular test road for motoring journalists; there is a good reason for that though. Go and see for yourself. What is your favourite driving route overseas and why? Grimsel, Furka & Susten passes. A wonderful triangle, I recce’d it last October ahead of a tour I am running for the MG Owners Club this October. Travel Destinations have been operating driving tours for the MGOC for twenty plus years, a testament to the company and loyalty we have from our customers. What is your most memorable journey? The Route Napoleon with my father in my Clio Sport Trophy. Hit it at the right time with barely any traffic. The balance of that car was simply phenomenal. What makes a perfect motoring holiday itinerary? You need to break your day up. I am not a fan of endless mile upon mile. Nice coffee stops, a decent pause for lunch and arrive at your destination in plenty of time to explore and of course, a cold beer to talk about your days exploits with your travelling companions. That would all take place in France my favourite country to tour in. What do you believe is the finest motoring event in the world? I am lucky enough to have attended a few of them. The one I try not to miss is the Goodwood Members Meeting, it may always be freezing, but the racing is second to none as is the attention to detail put into the event. The Mille Miglia is up there as a favourite too. What motoring events are you most looking forward to in 2019? Two of Peter Auto’s finest, the Spa Classic and the Grand Prix de l’Age d’Or. Can’t wait to get back to the Circuit des Remparts too after a few years of not attending. What services can you offer clients of South Downs Secure? Well if you want to go to the Le Mans 24 hours you need to speak to us. We have an amazing array of product available to cater for all budgets. Travel Destinations have been taking customers to Le Mans for over twenty years. It is not an easy event to get right but we now have three private sites down there for camping, glamping and also to create our pop-up hotel village, it’s quite a sight. However, the company was started by organising car tours, and we offer a huge array of tours to all sorts of events. We work for a lot of the car clubs too, most of them are long-standing clients. We love cars, and we take the travel aspect very seriously. Visit the Travel Destinations website HERE. If you’d like to find out more about Thomas Brimblecombe and how he helps South Downs secure clients, contact us, so we can put you in touch.